The College of Business Administration is founded, and is known as the School of Accounting. In the fall, night classes begin in accounting, business English and business law on the seventh floor of the 60-story, Gothic-styled Woolworth Building on Lower Broadway. A three-year certificate program is launched and an economics course is added to the curriculum. Attendance in the following year reaches 93 students. 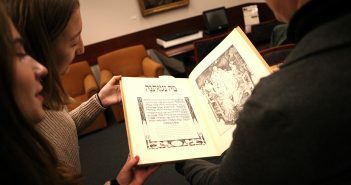 A baccalaureate degree program is initiated with a four-year day session and a six-year evening session. The first business bachelor of science degree is handed to George McGrath. A milestone year in the history of the business school: CBA becomes a member of the prestigious American Association of Collegiate Schools of Business. Also, at a gala dinner at the Waldorf Astoria, John T. Madden, dean of the School of Commerce, Accounts and Finance at New York University, inducts CBA into Beta Gamma Sigma, the foremost honor society for outstanding students of accredited business schools. 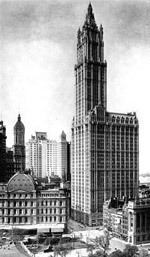 The college moves from the Woolworth Building to Rose Hill, where classes are held in Collins Auditorium. A faculty lounge and faculty offices are located in Robert’s Hall and the dean and his staff are situated in the north section of the Administration Building. 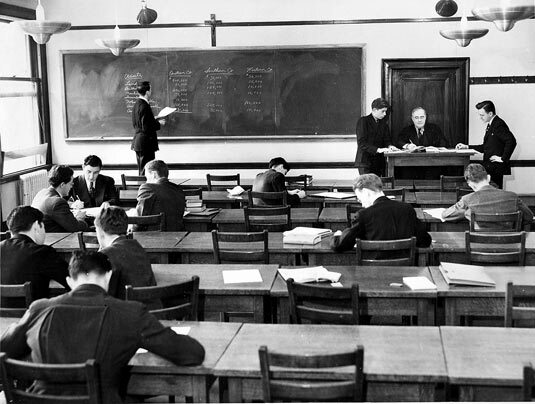 After one year, with young men being drafted into the armed services, all classes are held at night. With the $122,000 purchase of the Vincent Building at 302 Broadway, CBA acquires a new downtown home. Students number about 75. At this time, the Jesuit administrators make an important decision: Fordham’s downtown business school would be co-educational. CBA graduates four women in the Class of 1948. CBA returns to Rose Hill and occupies a war-barracks structure along Constitution Row. It is named Reidy Hall in memory of Daniel Reidy, Class of 1935, who died in the assault on the Anzio beachhead in southern Italy. Enrollment of matriculated students at the Campus Division and the Downtown Division peak at 1,943 in 1948-1949. Classes and offices of the Campus Division move to Dealy Hall, where the college prospers for 10 years under the leadership of Daniel Burke, S.J., Lawrence Wilson, S.J., and William Boyle, S.J. Fordham buys a five-story, red brick commercial loft situated adjacent to campus on Belmont Avenue. The building is renovated and business classes move from Dealy Hall to this new location, called Faculty Memorial Hall, where business professors still teach today. 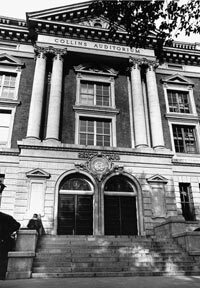 The building at 302 Broadway, which had housed the downtown business school for 24 years, is condemned to make room for federal office buildings. The following year, Fordham moves its downtown operations to the new Lincoln Center campus. 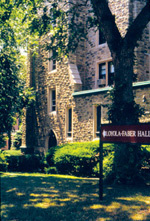 Business courses are taught under the supervision of the College at Lincoln Center until they are formally transferred to the administration of the dean of CBA at Rose Hill. 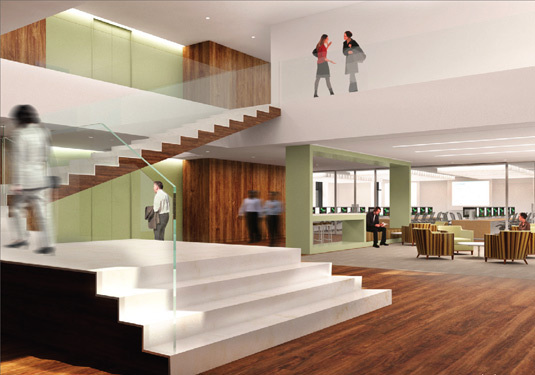 After Fordham Preparatory School moves from Hughes Hall to its current location, the University begins to transform Hughes into a residence hall with some offices for CBA. 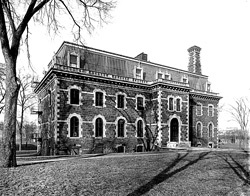 CBA offices move to the ground floor of Thebaud Hall, which was built from dark-gray granite stone quarried in what is now the New York Botanical Garden. CBA receives $150,000 from the U.S. Department of Education to develop an innovative program to give students an advantage in the global marketplace. Global Learning Opportunities and Business Experiences (G.L.O.B.E.) combines business specializations with studies in language and culture. Many students undertake internships with multinational corporations in New York City and abroad. Sharon P. Smith, Ph.D., is appointed dean of the college. 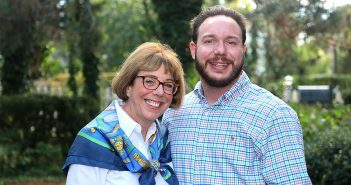 She is the first woman dean of a Jesuit business school. 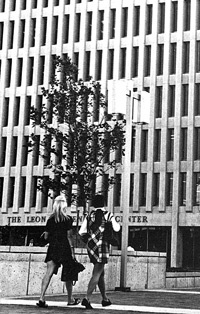 In the summer of 1996, CBA moves from Thebaud Hall to the third and fourth floors of Faber Hall. The college offers a certificate in arts marketing and audience development for multicultural audiences. CBA celebrates its 90th anniversary. The Board of Trustees approves the renovation of Hughes Hall, taking the first step toward converting it into a new home for the college. Alumnus Mario J. Gabelli makes a $25 million gift to CBA, which will be renamed the Gabelli School of Business (GSB).